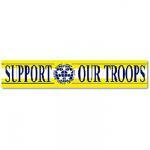 28" X 44" quality appliqued polyester decorative flag. Finished with a pole sleeve at top with sewn in tabs. The Flag reads correct from both sides. 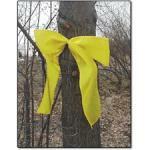 Our 16" nylon yellow bow is 100% made in the U.S.A. and comes with nylon ties that will attached to a fence or "The Old Oak Tree"
This 12" X 60" Horizontal Nylon Flag can be used many different ways. 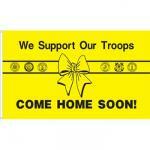 It comes with two brass grommets, so it can be attached to your snaps on your flagpole halyard, or can be displayed indoors as a banner to show your support. 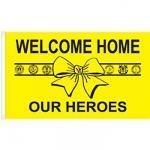 This 4" X 45" polyester Vertical Sash can easily attach to your exsisting pole. Has one brass grommet at the top of the sash. 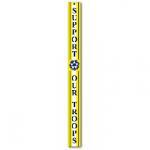 The We Support Our Troops flag was designed & produced by us during the 1991 GulF War as a fundraiser to support the families of the veterans serving in the Gulf War. The flag is still very poplual today. Made of quality knitted polyester and finished with canvas header and two brass grommets. 100% Made in America. Choose from 2" x 3" or 3" x 5" size. Quality knitted polyester and finished with canvas header and two brass grommets. Made by us right here in the good old USA. 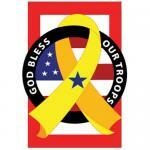 Has the emblems of all branches of the Armed Forces, and National Guard emblem. Choose from 2" x 3" or 3" x 5" size. 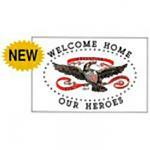 This new Welcome Home Flag is a great way to show them we care as our Men and Women come back from overseas. Made of quality nylon and finished with canvas header and two grommets. 3" x 5" size only. Made in the USA. 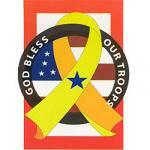 28" X 44" Nylon Applique Decorative 'We Support Our Troops', Yellow Ribbon Flag. Finished with pole sleeve at the top with sewn in tabs.